The shopping cart is the heart of an e-commerce website and we pleased to offer optimized hosting for X-Cart, a leading software known for its robust shopping cart solutions. 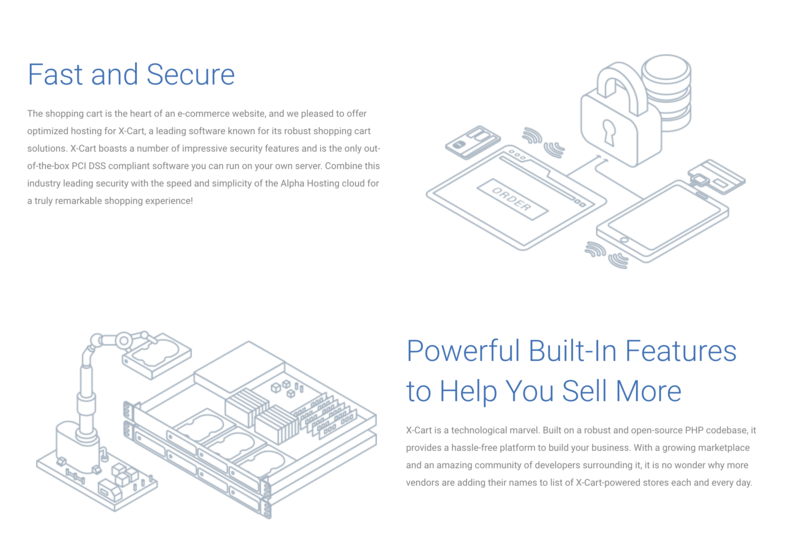 X-Cart boasts a number of impressive security features and is the only out-of-the-box PCI DSS compliant software you can run on your own server. Combine this industry leading security with the speed and simplicity of the Alpha Hosting cloud for a truly remarkable shopping experience! Launch your new X-Cart software with a single click using Installatron from the convenience of your control panel. With this automated one-click installer, it couldn’t be easier to get your site online! This system also provides automatic backups and a nice email notification delivered to your inbox when a new X-Cart version becomes available. When a new version is available, it can be applied with a single click, ensuring you always get the latest features and the most secure settings!